Formally recognized in Connecticut and all coastal states, the Public Trust Doctrine is considered a mix of common law, state law, property law, and a public right. This broad foundation makes the doctrine malleable and reflective of current thinking—but in parallel, a fundamental privilege of all citizens that cannot be subjugated to referendum, and which, in some instances, has been written directly into state charters as a “constitutional right.”"
The Public Trust Doctrine is centrally important within state instream flow programs because it forms the foundation of resource management metrics for land, fishery and wildlife management agencies; frames the accountability, obligations, and opportunities these agencies must pursue, and dictates that they reflect the importance and dynamic interrelationships of biological, physical, and hydrological processes. Title to soil underlying navigable waters was retained in the crown, such that these lands could be maintained as “public highways,”" and the original thirteen states own the beds and banks underlying tidal waters as a matter of their conquest of England. Other states acquired ownership of these waterways upon their statehood pursuant to the Equal Footing Doctrine, under which all subsequent states were admitted with the same rights as the original thirteen (with title to tidal and navigable waters fixed at the date of its admission to the United States). In 1953, Congress validated this equal footing right of the states to submerged lands beneath inland navigable waters by enacting the Submerged Lands Act, (67 Stat. 29, 43 U.S.C. §1301) which confirmed and established States' title to and interest in “lands beneath navigable waters within the boundaries of the respective States” (United States v. Alaska (1996) 521 U.S. 1, 5-6, and reaffirmed in 2005 (Alaska v. US). 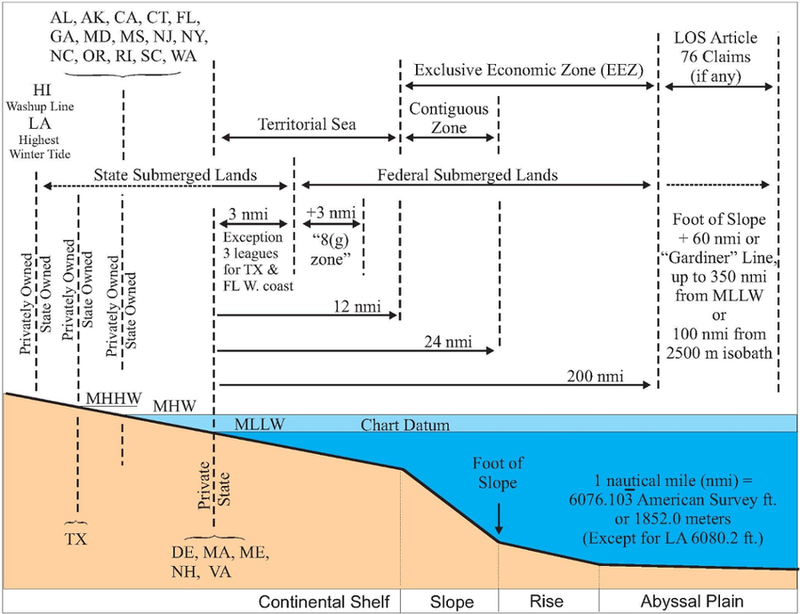 Each coastal state (exceptions: Florida and Texas) owns the territory extending three nautical miles (3.45 land miles) from the shore at mean low tide, and has jurisdiction to decide whether or not, and under what terms, to lease the territory for commerce (example: oil and gas exploration and recovery). The federal title test for navagability is based on a waterway being receptive to navigation as a highway for public passage or commerce in its ordinary and natural condition at the time of statehood. In 1870, the Supreme Court set precedents for this test in The Daniel Ball (77 U.S. 557) establishing that a waterway that is navigable in fact is navigable in law (and thereby subject to obligations of the public trust). Although the river must be navigable at the time of statehood, this only means that, at the time of statehood, regardless of the actual use (or lack thereof) of the river, the river must have been disposed to use as a highway for transportation and commerce. Because navigation may be difficult and at places interrupted (examples: rapids, waterfalls, or sandbars, which may require portaging around) does not render a stream un-navigable. The congressional authority to establish navigability (and subsequent federal title) differs slightly. The natural & ordinary condition of the body of water at time of statehood determines navigability for title; whereas, the key issue for commerce and congressional management purposes is determined by whether the body of water could be made navigable by reasonable artificial improvements. 3) past use or suitability for past use. The extent and manner of use of a navigable waterway is unimportant as long as it holds capacity for use as an avenue of transportation and commerce. As such, waterways that are determined non-navigable under the federal title test may nevertheless qualify under the federal commerce clause test for navigability, and through its commerce power, the US retains a navigational easement in the navigable waters for the benefit of the public, regardless of who “owns” the riverbed. Therefore, private ownership of property in the beds of navigable streams is conditioned by the exercise of the public right of navigation and title to the banks and bed of a navigable stream up to the high water mark (private ownership is subject to a “navigational servitude” which is the public right of navigation for the use of the people at large). Similarly, a waterway found not to be navigable for commerce clause purposes can be navigable for state title purposes. A river which is not of itself a highway for commerce with other States or foreign countries (does not form a highway by its connection with other waters, and is only navigable between different places within the State), is not a navigable water of the US, but only a navigable water of the State. A finding of state ownership to the bed of a navigable waterway cannot be construed as a private property taking because under the equal footing doctrine, it passed from the federal government directly to the state upon granting of statehood (it was never in private ownership). Vesting title to a waterway in the crown pursuant to the English common law test for navigability assessed “totality” (whether a waterway is subject to the “ebb and flow” of tides), and Connecticut recognizes both this test and the federal navigable-in-fact test (see: “Notable CT Cases,” and also, “Application of the Public Trust Doctrine”); as well as congressionally identified (commerce-based) tidelands. The law differs mildly among the 50 states but generally limits the rights of ocean front property below the mean (average/ordinary) high tide line (ordinary high water mark, or OHWM). Connecticut has interpreted and enforces the doctrine this way. Massachusetts and Maine (which share a common legal heritage: the Massachusetts Colonial Ordinance of 1641-47) represent the exception and are the most restrictive: allowing private ownership as far as the mean low water line but excepting for public rights to fishing, fowling and navigation with permits. Most states allow free access to the intertidal zone for walking, swimming, sunbathing, et al. The intertidal zone (also known as the foreshore, and sometimes referred to as the littoral zone: see illustration) is the area that is exposed to air at low tide and submerged at high tide (briefly: the area between tide marks). In Connecticut, this does not enfold the right to cross private (littoral) property to reach the shore, but does preclude private property owners from excluding the public below the OHWM. This elevation is obtainable from standard references, including the U.S. Army Corps of Engineers Tidal Flood Profile charts. The OHWM is calculated as the average high tide line calculated across a 14.1 year cycle. In practical terms, this means that neither property owners nor the public would likely to be able to precisely identify its specific location absent local charts and a professional survey. Since it would be probable then, that the public would miscalculate this location, the burden of proof would therefore fall on the individual property owner to demonstrate both action of and intent to trespass above the OHWM in an issue of dispute. Intertidal zone: the intertidal zone (also known as the foreshore, and sometimes referred to as the littoral zone) is the area that is exposed to air at low tide and submerged at high tide (area between tide marks). [2, 3] (Dawson, 1999; Joseph L. Sax: The Public Trust in Stormy Western Waters, 1997); and (Blease, 1999). Hydrology is the scientific study of the properties, distribution, and effects of water on the earth's surface, in the soil and underlying rocks, and in the atmosphere. Actions can be taken in the public interest that harm the public trust. State governments are generally charged with acting in the public interest, and duly strive to base most decisions and actions on satisfying this requisite. Public interest relates primarily to economic or value considerations, and as such, almost any action that has public value or generates economic gain is in the public interest. Public trust, in contrast, refers to matters of common property (such as water, fish, or wildlife) that is held “in trust” by a sovereign (the state of Connecticut) for the use and benefit of its beneficiaries (present and future generations, typically, but not excluded to, citizens of the state). Even though the concept of public interest forms the basis of and does complement public trust, it is quite possible (and common) that actions taken in the public interest may harm the public trust. Riparian (adj. ): of, pertaining to, or situated or dwelling on the bank of a river or other body of water (riparian villas); and in law: a person who owns land on the bank of a natural watercourse or body of water. Craig, Robin K.: Guide to the Eastern Public Trust Doctrines: Basic Issues, Classifications of States, and State Summaries. Exceptions to the three-mile limit are Texas and the west coast of Florida, which for historical reasons own the seabed out to three leagues (10.5 statute miles) from the shore. Edgar Wesley Owen (1975), Trek of the Oil Finders, American Association of Petroleum Geologist, Memoir, 6. The federal tests of navigability for determining title and defining Congressional authority differ in focus. However, both delineate whether the body of water was navigable in fact/in law as of the date a state came into the Union, not at the time the determination of navigability was made. Economy Light & Power Co. v. U.S. (1921) 256 U.S. 113, 122 [65 L.Ed. 847, 850]. Courts examining the threshold of whether a body of water is “navigable” and subject to the Trust Doctrine have evolved their analysis over time, one of the more notable early tests being Wisconsin’s “saw log test,” which reflected the state’s interest in protecting commercial navigation: if a stream was capable of floating a “saw log” to market, the body of water was navigable. State of Montana v. United States (1981) 450 U.S. 544, 555; Oregon ex rel. State Land Bd. v. Corvallis Sand & Gravel Co., (1977) 429 U.S. 363; U.S. v. Cress (1917) 243 U.S. 316; U.S. v. 412.715 Acres of Land, Contra County, Cal. (D.C. 1944) 53 F.Supp. 143. Sierra Pacific Power Company v. Federal Energy Regulatory Commission (9PthP Cir. 1982) 681 F.2d 1134,1138; The Montello (1870) 78 U.S. (11 Wall.) 411, 415. N.B. : This essay is written for informational purposes, not as legal scholarship, researched from publicly available sources and government documents. We strive to keep these links current, but occasions may arise wherein upgrades to State of Connecticut sites or editing of other portals by their domain owners may cause the links to mis-direct. If this happens, let us know and we will work to correct. To fight its trecherous trend.